Non-surgical Spinal decompression therapy may be the answer you have been looking for. This treatment has helped thousands of back pain sufferers, even after other treatments have not worked. Spinal Decompression Therapy does not utilize drugs or surgery and has had very impressive results. 80-90% of all adults will suffer with low back pain at some time in there life. Lower back pain is the second leading cause of visits to doctors' offices. Statistics indicate that 15-20% of the population has lower back pain in any given year ...approximately 32 million cases. "This takes account of two consistent observations about lower back pain: firstly, a previous episode of lower back pain is the strongest risk factor for a new episode, and secondly, by age 30 years almost half the population will have experienced a substantive episode of lower back pain. These figures simply do not fit with claims that 90% of episodes of low back pain end in complete recovery." DTS Spinal Decompression Therapy is FDA cleared and has been clinically proven with a very high success rate for pain associated with herniated or bulging discs...even after failed surgery. The vacuum effect accomplishes two things. From a mechanical standpoint, disc material that has protruded or herniated outside the normal confines of the disc may be pulled back within the disc by the vacuum created within the disc. After a significant amount of research, PEORIA CHIROPRACTIC chose the Triton DTS system manufactured by the Chattanooga Group, the premier manufacturer of physical medicine equipment. With its unparalleled design, proven history and the Chattanooga Group behind it, the Triton DTS system is without question, a very good traction therapy. 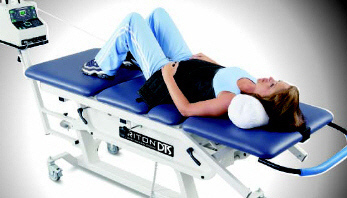 We also selected the Triton DTS system due to its ability to treat discs in both the neck and the low back. The Triton DTS computer is the key. It controls the variations in the traction pull allowing for spinal decompression and eliminating muscle guarding that is typical in conventional traction devices. herniated, protruding or bulging discs, spinal stenosis, facet syndrome, or arm or leg pain/numbness. Spinal decompression therapy is not recommended for pregnant women, patients who have severe osteoporosis, severe obesity or severe nerve damage. Spinal surgery with instrumentation (screws, metal plates or cages is also contraindicated. The specific treatment plan will be determined by the doctor after your examination. Based on current research, the best results have been achieved utilizing 20 sessions ($75 each) over a 6-week period. Based on that most common protocol, the total cost of the DTS treatments would be $1,400 which is a small fraction of what many other doctors are charging. We want make it easy for you to learn if you are a candidate for Spinal Decompression Therapy. If you need any additional information, please call our office at (309) 693-1212. PS: Remember, for only $65, you can learn if you are candidate for Spinal Decompression Therapy! Why continue to suffer when the solution might be only a phone call away? PPS: One last thing. If I determine that you are not a candidate for Spinal Decompression Therapy, I will tell you that and work to refer to you a doctor who can help you. Mushinski M. Average hospital charges for medical and surgical treatment of back problems: United States. 1993 . Statistical Bulletin. Metropolitan Life Insurance Co., Health and Safety Division. Medical Dept., April-June 1995.